This ancient surname is either locational from the Village of Goodrich in Hereford, or more usually it derives from the Olde English pre 7th century personal name 'Godric' translating as 'God-rule'. 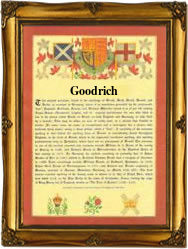 Given such a meaning it is not perhaps surprising that the surname has developed widely and today includes many variant spellings including Goodrich, Goodridge, Gooderidge, Gooderick, Goodrick, Goodricke, Godrich, Godridge etc. In fact it could be said that the origin in all cases is the same as the village, first recorded in the year 1102 during the reign of King John (1199 - 1202) was formerly Castellum Godric, the castle of Godric. There are a number of early recordings, and examples include Hugo Godryk of Suffolk in the register of Ely Abbey for the year 1221, Jane Godrige of Cambridge in the Hundred Rolls of 1279, and James Goodrich of Colchester in 1341. Later examples are those of Albreda Goderik of Yorkshire in 1381, John Guddrig, also of Yorkshire in 1477 and Elizabeth Gutteridge of Suffolk in 1659. The Coat of Arms has the blazon of a silver shield, a red cross between four knights spurs, pierced gold. The first recorded spelling of the family name is shown to be that of Thomas de Goderigge, which was dated 1273, in the Pipe Rolls of Wiltshire, during the reign of King Edward 1, known as the Hammer of the Scots, 1272 - 1307. Surnames became necessary when governments introduced personal taxation. In England this was known as Poll Tax. Throughout the centuries, surnames in every country have continued to "develop" often leading to astonishing variants of the original spelling.